Congratulations to fellow blogger Donna at Funky Junk Interiors. Donna just passed the 3000 follower mark. And there is a really good reason for that! Donna resides in BC Canada and she says she loves to create something out of nothing. And boy, can that girl create! This amazing desk and workspace is just one example of her talent and creativity! blogging tips and the best weekend link parties. To celebrate her 3000 follower milestone, Donna is having a giveaway. But being true to herself, this is not your typical giveaway. Donna chose items based on her favorite words -rust, metal, vintage, typography, woody stuff, rustic and distressed! So, if you are a junk loving girl like Donna (and me too!) 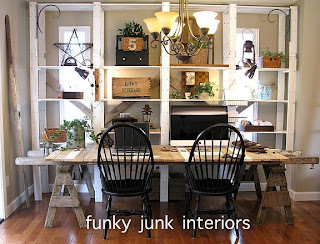 head on over to Funky Junk Interiors. Donna is truly passionate about what she does and that passion is contagious! I promise, you will be inspired! Hi Sharon! Thanks for the heads up, I can't believe I've never been on that blog before, it sounds right up my alley! I love that picture!! !